This week saw the first full length public performance since at least the 1970s of the Bedhaya Pangkur, a sacred ritual dance of the Surakarta royal palace. 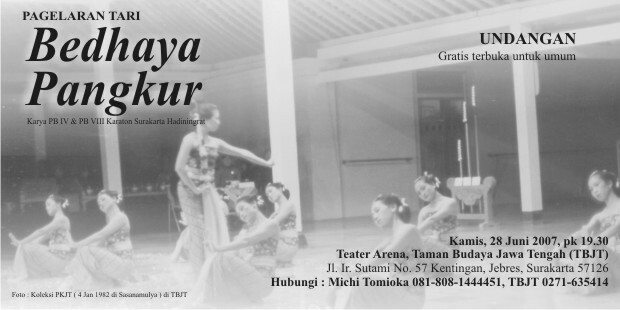 But the dance’s revival has been led not by the palace or by Surakarta’s illustrious arts institute, but by a Japanese researcher – for whom this performance is a dream come true. The air pefumed with incense, the floor scattered with rose petals, we are in the realm of ritual and meditation. The slow processional entrance of the nine female dancers, immaculately costumed, sets the ceremonial tone, and the full choir of male and female voices gives a sense of grandeur. The rhythmic chime of the kamenak, floating above the sparse gamelan configuration used for this kind of dance, gradually becomes hypnotic. As the others kneel, a single dancer moves alone, her eyes cast down, her focus inward, her face glowing with an expression of quiet bliss in her absorption. Soon the whole group joins her, the small, slow, delicate movements of their hands and arms weaving a continual flow of inscrutable meanings. Their geometric positions in the space, periodically dissolving and reconstellating, seem to reflect something essential of the arrangement of the cosmos. Yet sublime as it is, by the end of an hour they are sweating visibly at such a feat of minute physical control and unbroken mental concetration. This is not the natural environment for the dance. We are in a theatre, complete with a full lighting rig, and packed with spectators – a gathering including many leading lights of the Solo arts community, along with a smattering of grey haired Western enthusiasts. A couple of heavy duty video cameras hint at the historical importance of the event. 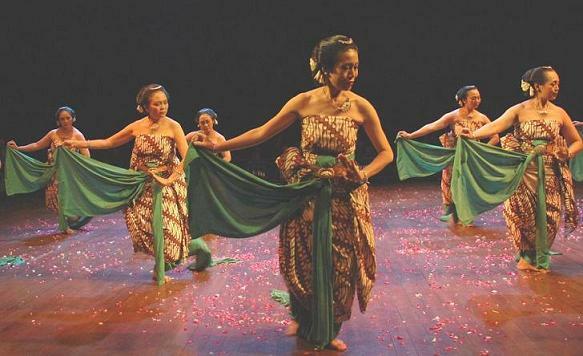 The dancers themselves are not denizens of the royal palace, the Kraton. And the soloist, Michi Tomioka, who is also the director and producer of the whole event, is not Javanese, but Japanese. For it is the Kraton where this dance, the Bedhaya Pangkur, has its true home. The palace dances, like the Bedhaya, are not entertainment, but sacred rituals, as well as repositories of ancient tradition, training practices in courtly refinement, and assertions of the legitimate authority of the ruler. The most sacred of them all, the Bedhaya Ketawang, is performed just once a year to commemorate the coronation of the current Susuhanan (sultan), and it is laden with traditions and taboos. It may only be performed in the presence of the Susuhanan; the dancers must fast, wear bridal dress and cover themselves in tumeric. 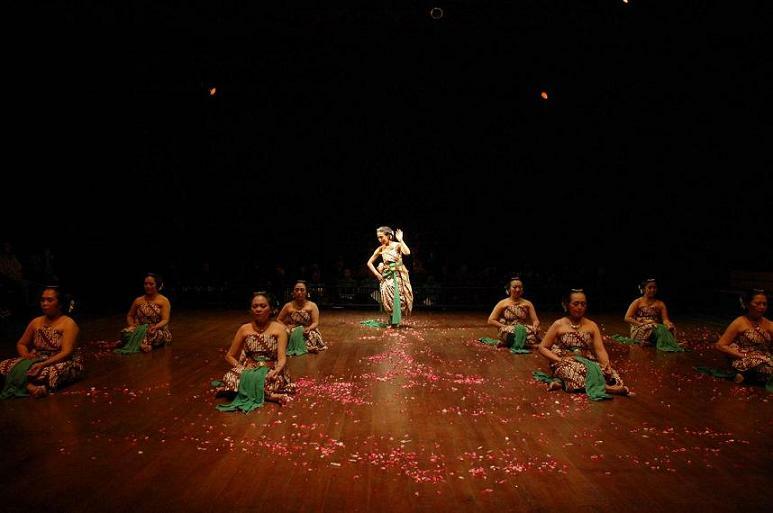 Its origins, according to one of many legends, is the love dance of the goddess Ratu Kidul, Queen of the South Seas, for the great Sultan Agung in the 17th century. The practice of this greatest of Bedhaya has been supported through the dancing of several subsidiary forms, of which Bedhaya Pangkur, dating from around 1800, is one. Something so sacred, so esoteric, must also be protected, and until recently, it was forbidden for anyone outside the Kraton to learn the dance. But ironically, the result has been that much Bedhaya material has, over the years, been lost. There are musical scores in the Kraton for Bedhaya for which the movements are now irrecoverably forgotten. 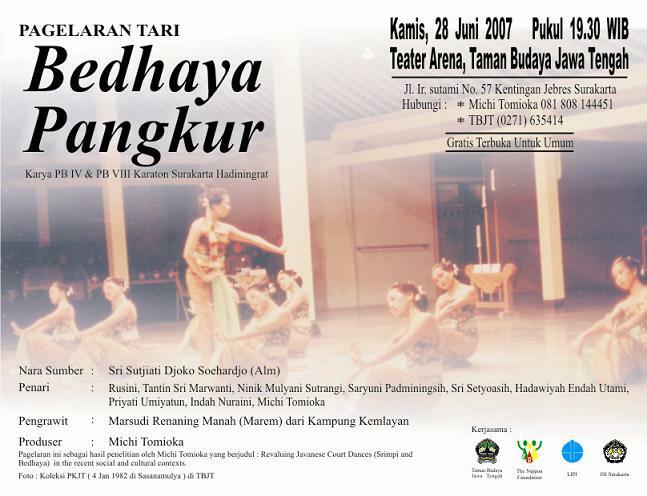 The survival of the Bedhaya Pangkur, as with other court dances, owes much to a project, initiated by the Soeharto regime in the 1970s, to preserve traditional art forms in Indonesia. At that time, the Kraton was persuaded allow a number of professional dancers to study with its master teachers, and through them, knowledge of Bedhaya and Srimpi (another court dance) has passed into what is now ISI Solo, the city’s arts institute. But the preservation of the dances also led to their corruption. According to Michi, who is currently completing doctoral research on the subject, the versions that are currently practised at ISI are shorter than the traditional Kraton versions, and at a faster tempo. There is also a new emphasis on exact synchronisation of all the dancers’ movements. Originally, there was more room for individual expression. Indeed, dancers in the Kraton were known to try to catch the Sultan’s eye, not least by using the movement judiciously to reveal a little bare flesh here and there. Michi attributes the changes in the dance both to the individuals involved in teaching back in the 1970s, to general changes in Indonesian society towards a faster paced life, and to the influx of ideas from modern Western art. So while the Kraton is always revered as the great source of Javanese art and culture this can, she feels, be lip service. While she is glad that the dances are alive and developing – and they have evolved somewhat even with in the Kraton – there have also been losses: losses of details, of a sense of the integrity of the music and the dance, and the insertion of “many strange things”. Michi’s goal, then, is to revive and document the pre-1970s court dances. But how did a Japanese woman come to take on the revival of so Javanese a tradition? It is a story of chance, perseverance, and, perhaps, of a dream come true. Michi was always fascinated by dance she saw on television as a child, but there was no opportunity to learn in her small town. She studied traditional Japanese dance at Osaka University, but as an academic, not a practitioner. Her first real contact with Javanese arts was when she joined a gamelan group – because it was free, and mistakenly thinking it was Balinese. 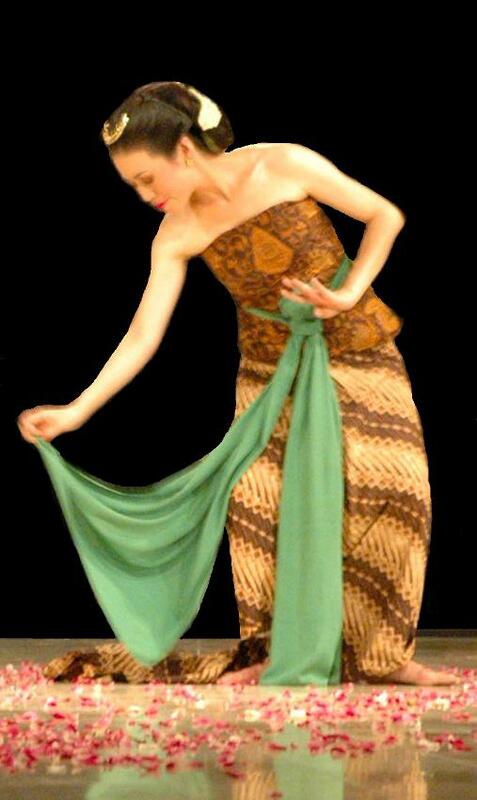 This became the inspiration for a month in Java after graduating, during which she learned her first Javanese dance, albeit a popular dance, not from the court. After that, all she wanted to do was to return, and, by dint of hard work and hard saving, and repeated applications to funding bodies, return she did - repeatedly, eventually in stays of several years each. During those visits, she she studied in the Kraton with a former student of the old masters who were teaching the court dances before the 1970s. This week’s performance is a culmination of her work, although she also plans further performances in Jakarta and elsewhere. It has taken a long time to gain recognition, and, as an outsider, it hasn’t always been easy. It was actually in Sumatra that her knowledge of Javanese arts first began to be publicly valued. Although she doesn’t mention it, it seems she has had to steer her way through a certain amount of politics from time to time. There are those in the Kraton who still disapprove of public knowledge and public performance of the palace dances. And Michi’s dancers include some of the most senior and respected dancers in Solo, steeped in the Institute’s version of the traditions. Perhaps, she says, as a Japanese, her starting point is different from that of her Javanese colleagues – but if there are many routes to the top of a mountain, they still all meet at the summit. Pagelaran Tari Bedhaya Pangkur took place at Taman Budaya Jawa Tengah, Surakarta, on 28 June 2007. "Bedhaya Pangkur Kababar ing TBS"
"Michi Tomioka asli Jepang wasis mbeksa"
Kacihna jejere asli wong Jepang, pranyata Michi Tomioka wasis mbeksa bedhaya apadene beksan tradhisi Jawa liyane. Miturut pratelane Michi sawetara dina kapungkur, dheweke pancen wis sawetara wektu nyinau lan gladhen beksan-beksan tradhisi Jawa kang pepunjer saka Karaton Kasunanan Surakarta. Ing babaran beksan bedhaya pangkur cakepan asli Karaton, sawetara dina kapungkur, Michi maragani pambeksa utama. Pasuryane minangka wong Jepang pancen ora bisa ngapusi atusan wong kang mindeng babaran beksan sasuwene sakjam iku. Kacihna ngrasuk busana dodot, bathik cakrik parang lan asesoris busana tradhisi Jawa liyane, nanging pasuryane tetep nuduhake yen Michi iku dudu wong Jawa. Ananging nalika mbeksa, pranyata ora kalah luwes kalawan pambeksa liyane kang asli wong Solo. Michi kang klairan Jepang taun 1966, ing taun 1996-1998 lan taun 2000-2003 sinau seni tradhisi Jawa ing Sekolah Tinggi Seni Indonesia (STSI) Solo (saiki Institut Seni Indonesia utawa ISI Solo-red). Michi sinau beksan srimpi lan bedhaya ing Karaton Surakarta Hadiningrat. Dwija utamane swargi Sri Sutjiati Djoko Soehardjio lan Sulistyo Tirtokusumo. "-Pertunjukan 'tari Bedhaya Pangkur' di TBS semalam- Merekonstruksi kembali karya PB IV dan PB VIII"
"Saat keaslian Bedhaya Pangkur kembali hadir"
"Pagelaran Bedhaya Pangkur di Taman Budaya Surakarta"
"Pergelaran Tari Bedhaya Pangkur di Solo"
"Mahasiswi Jepang Gelar Tari Bedhaya Pangkur"
2007年6月26日 07:00-07:10am Ria FM "Selamat Pagi Surakarta"
"Tari Bedhaya Pangkur akan disuguhkan dengan kosep asli"
"Bahasa Kagok Penari Jawa Itu"
"-Michi Tomioka, Tertantang Padukan Tari Jepang-Indonesia- Karakter Jepang Serba Cepat, Solo Sangat Lambat"
"-Kesenian- Ketika Penari Asal Jepang Berlatih Menari... "